Tags make organizing your Photoshop files easy. After you acquire your images in the Organizer, you can tag images with all kinds of information. You can provide tags according to the dates when you took the pictures, the subject matter, or some other custom categories, so that the images are easy to sort. By default, Elements provides a set of icons displayed adjacent to all tag names. You can change the icon appearance to match a view similar to one of the photos you tag for a given keyword. Right-click a tag in the Tags panel and choose Edit. The Edit Keyword Tag dialog box opens. Click the Edit Icon button. The Edit Keyword Tag Icon dialog box opens. The Edit Keyword Tag Icon dialog box enables you to add or change a tag icon. Select an image for the tag icon. 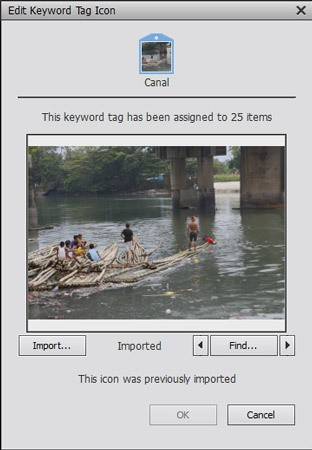 Click the Import button to import an image for the icon. Or click the left and right arrows to scroll through all the images with this tag and choose one for an icon. Additionally, you can click the Find button to open a window displaying thumbnail images of all the photos with this tag. (Optional) Crop the image by moving handles on the rectangle displayed in the Edit Keyword Tag Icon dialog box. Click OK when you finish editing the icon. 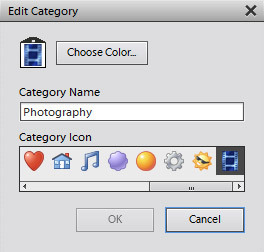 The icon displays in the Tags panel. We refer to custom tags as those tags you create in the Tags panel. Elements offers you a number of preset tags that you can use to tag your photos, and these are known as default tags. You can manage tags by using menu commands from the Tags panel drop-down list (click the down arrow adjacent to one of the + icons) and other commands from a contextual menu that you open by right-clicking a tag on the Tags panel. New Keyword Tag: Create a new tag. New Sub-Category: A subcategory is a tag nested inside another tag. Create a subcategory by choosing New Sub-Category from the New menu; a dialog box opens, prompting you to type a name for the new subcategory. Edit: Choose Edit to open the Edit Keyword Tag dialog box. This dialog box appears exactly the same as the Create Keyword Tag dialog box. Import Keyword Tags from File: If you export a tag, the file is written as XML (eXtensible Markup Language). When you choose From File, you can import an XML version of a tags file. Save Keyword Tags to a File: You can save tags to a file that you can retrieve with the Import Keyword Tags from File command. Collapse All Keyword Tags: Tags appear in lists that can be collapsed and expanded. An expanded list shows you all the subcategory tags. Choose Collapse All Keyword Tags to collapse the list. Show Large Icon: Click this option to display the tag icons larger in the Tags panel. When you change the view to large icons, you see the custom edits you make when editing an icon. When you create a custom tag, you can modify its appearance. With the default tags that Elements provides, you can make some changes to the tags’ appearances, but in limited ways. For example, you cannot add a custom image for the tag icon. However, you can modify the names for the preset tags, and you can add custom subcategories. On one of the predefined categories, right-click and choose Edit. The Edit Category dialog box opens. In the Edit Category dialog box, you can make some changes to the tag icon. Click the Choose Color button to change the color of the tag icon. To choose an icon for the preset category, move the scroll bar horizontally and click the icon you want to use. You’re limited to the images Elements provides you for displaying icons on the predefined categories. From the People Tags panel drop-down lists (+ icon), choose New Person. Click New Person to add a new tag name. The New Person dialog box then opens. Provide a name in the New Person dialog box and choose a group from the Group drop-down list. Click OK and repeat these steps until you create all the subcategories you want. Notice that you don’t have options for creating custom icons or for adding icons provided by Elements. All the subcategory icons are predefined for you where the five new categories in the People Tags panel appear. The People tags now has five new subcategory tags of its own.